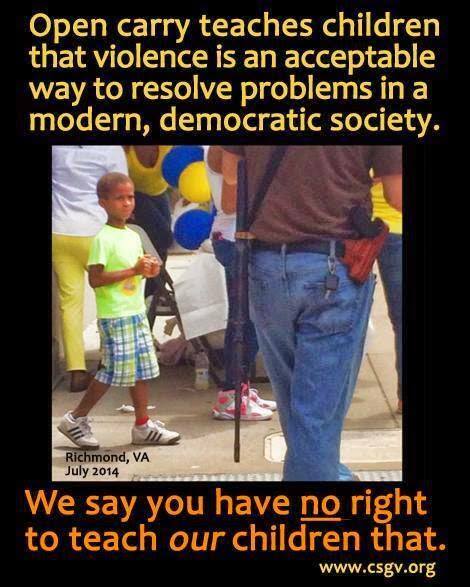 An organization called The Coalition to Stop Gun Violence posted this meme. This organization seeks to “strengthen our gun laws.” So, if these people manage to make open carry illegal, and I do it anyway, what happens? Well, some guys with guns show up, take my gun and lock me in a cage. If I resist, they shoot me. Apparently, The Coalition to Stop Gun Violence believes wholeheartedly that violence is an acceptable way to resolve problems in a modern, democratic society. So, what’s their problem with open carry?